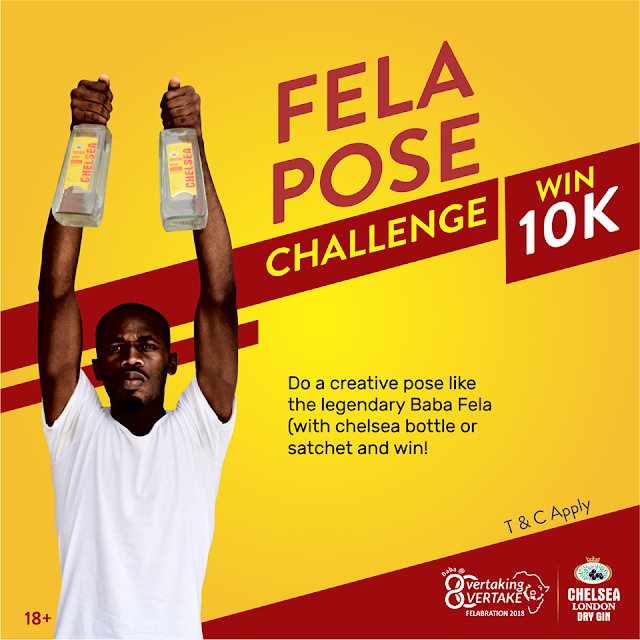 Win N10,000 in Fela Pose Challenge, Sponsored by Chelsea London Dry Gin. Felabration is an annual week-long festival of music, art, afrobic symposium and school debate in commemoration of the birth of Fela Anikulapo Kuti. The Legend, The Music Icon. Do you think you can recreate the iconic Fela pose to honour Fela Anikulapo Kuti? Enter the Fela Pose Challenge and stand a chance to win N10,000 cash & other gifts. 1. Take a creative picture of yourself posing in the iconic Fela pose holding Chelsea London dry gin bottles or sachets.